Kingfisher is Europe's leading home improvement retailer boasting over 900 stores located in eight countries, with over 80,000 employees. Ranked third globally, Kingfisher reported an impressive £10.4 billion in sales1, serving over six million customers in-store every week, ranging from everyday DIY customers to trade professionals. 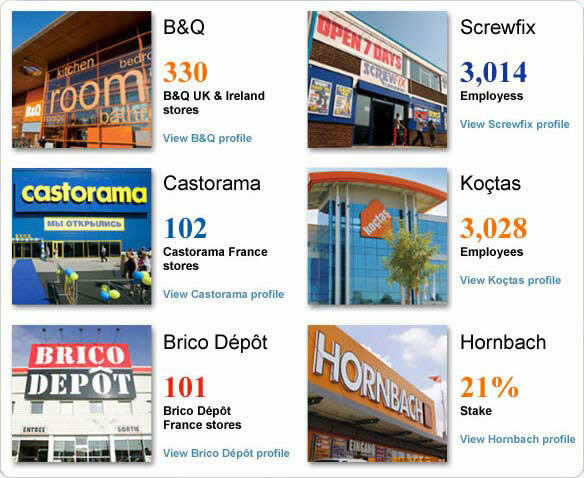 Kingfisher operates under the renowned banners B&Q, Castorama, Brico Dépot, Screwfix, Koctas2 Hornbach3. 1 Year end sales for January 2011. 2 Kingfisher has a 50% joint venture with Koç in Turkey. 3 Kingfisher has a 21% interest in Hornbach, located in Germany. 8 countries: France, Poland, Russia, UK, China, Spain, Turkey, Germany. 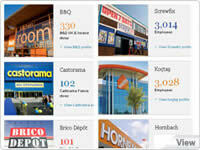 6 banners: Castorama, B&Q, Brico Dépôt, ScrewFix, Koctas (Turkey), Hornbach (Germany). 6 millions customers in-store per week.